Just a quick reminder that Thursday is our June WiN meeting. 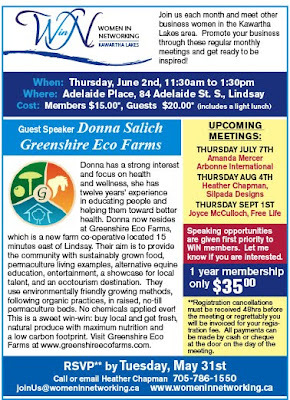 Our guest speaker is Donna Salich of Greenshire Eco Farms. Full details below. Please let me know as soon as possible if you will be attending. Reservations and cancellations must be received no later than noon Tuesday, May 31st. 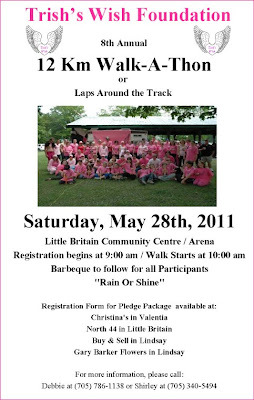 I am organizing a ladies night this fall and it will be held at the Lindsay Fairground or the Armories. I have been in charge of the ladies nights at Canadian Tire and for our local firefighters for the past 8 years. The bonus for all of us---being business owners---we pre sell tickets so I can guarantee at least 300 people in front of you. We have put a cap of 500 tickets to be pre sold--there will be at least 50 vendors---and the most amazing thing will be our fashion show with our local firefighters....they have drawn a large crowd in the past and this is why we are able to sell so many tickets. This is a very upscale ladies event and we are currently working on a theme---possibly a mascarade--beach or black and white night....this is still in the works. 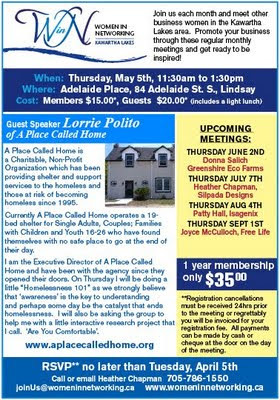 Just a quick reminder that I will need to know if you will be attending this Thursday's meeting at Adelaide Place. Please let me know by noon Tuesday, May 3rd. Below is a list of attendees. If you are on the list and cannot attend please let me know as soon as possible. Full meeting details below. If you remember to bring a small door prize it would be greatly appreciated.